Eva Herzigova graces the pages of Vogue Paris‘ May 2018 issue. Photographed by Juergen Teller, the Czech model wears elegant fashions for the editorial. Posing with a violin, Eva wears eccentric looks in a color palette of mainly black and red. Fashion editor Anastasia Barbieri dresses the blonde in designs from the likes of Givenchy, Calvin Klein and Valentino. 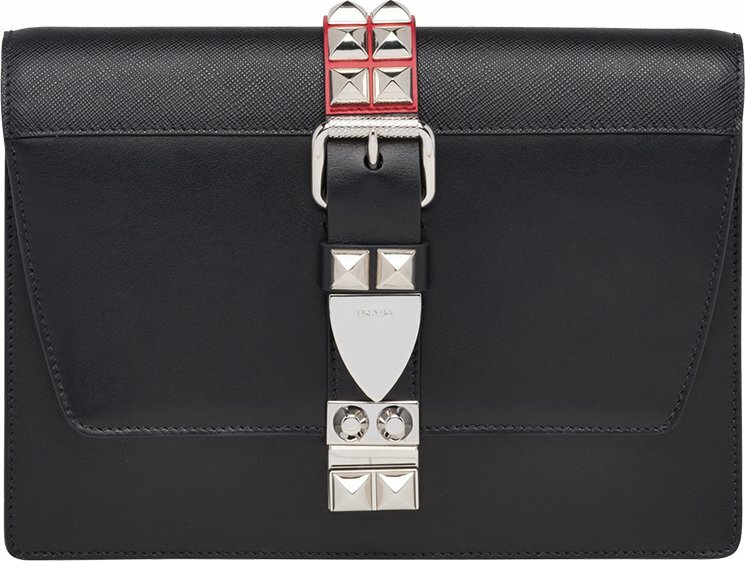 Box pochette, diagramme quilting and now buckle-studded strap, it really never gets boring at Prada. And today, they have a wide variation of different handbag styles, more than we can collect. Still, we hope they will bring back the classic Saffiano Lux Tote one day, the bag that we love so dearly. 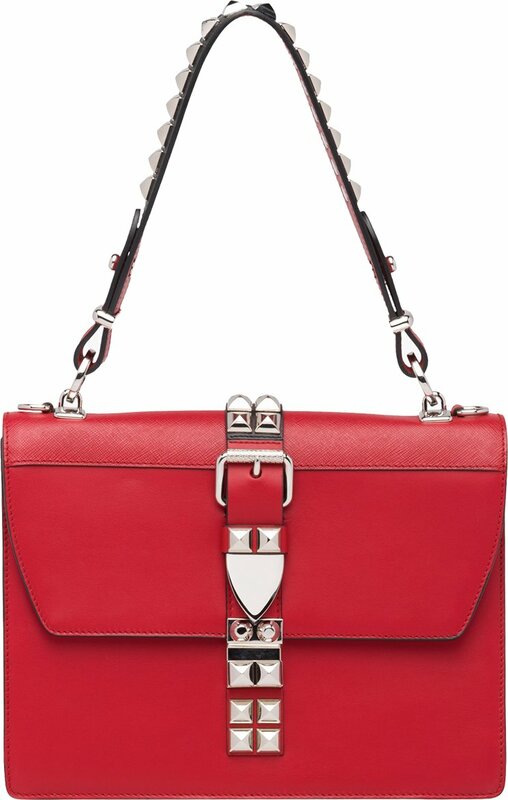 But anyways, meet the new Prada Elektra Bag. Prada is challenging all fields of fashion, but aren’t they trying to do a bit too much? 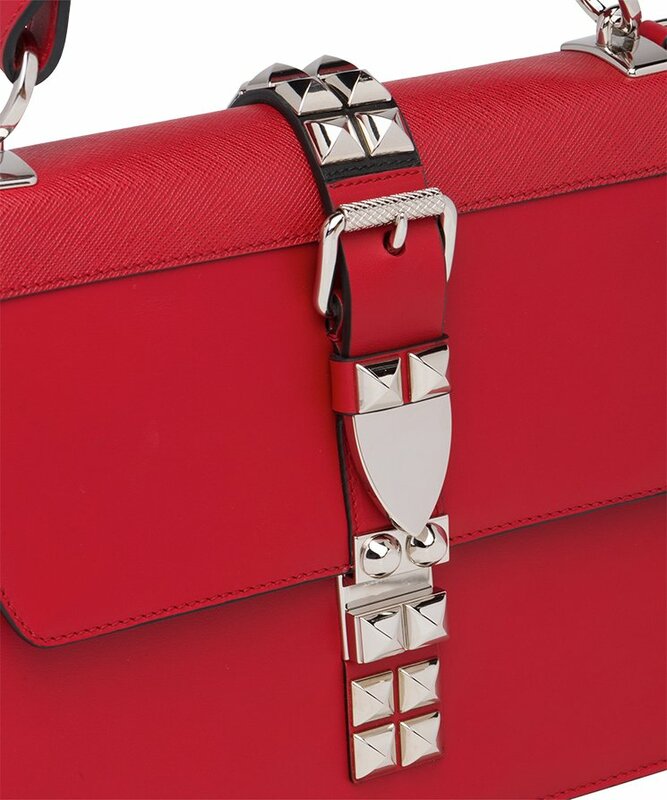 The pyramid studs on the Elektra Bag do remind me of the Valentino, especially the red colored handbag. The Elektra Bag is made with a mix of calf and saffiano leather. Both leathers are durable, especially the saffiano, which is unbreakable. 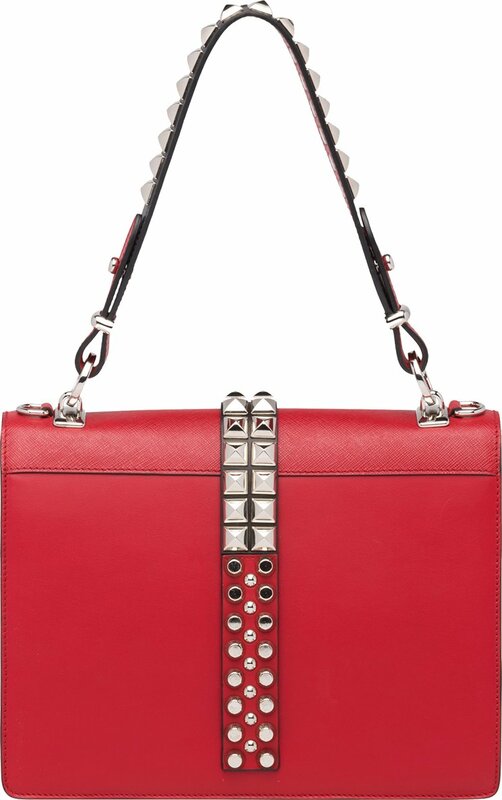 The studs have been embellished in different parts; first on the center buckle strap, but also on the handles. 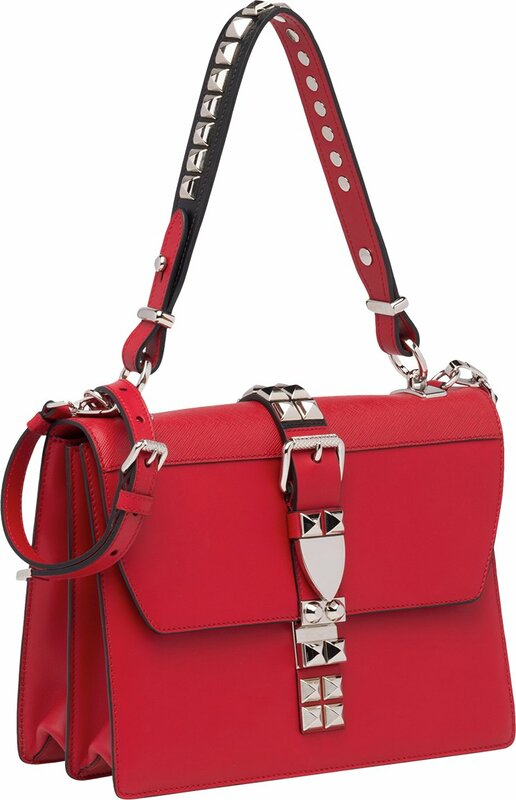 The front features a flap with push-lock clasp and you can sling it on the shoulder as it comes with a removable leather strap. It’s a chic bag with tremendous space in the interior. And it can function as a great everyday bag, blending with casual clothing. So how does the inside of this bag looks like? 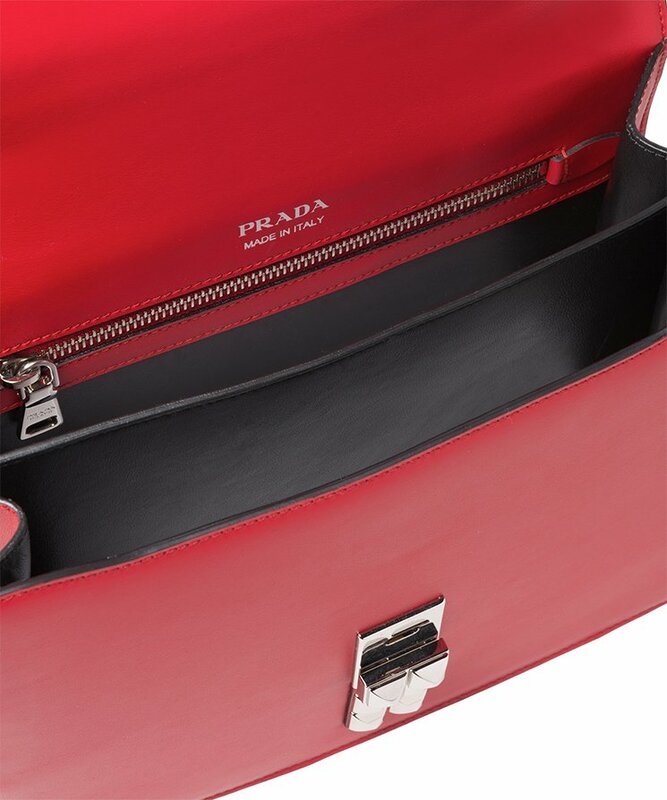 There are two compartments and one zipped pocket. Both are big enough to help you transport all your basic needs and there is even space for more. Measuring 4.2’ x 7.2’ x 10.2’ (D x H x W) inches, priced at $2840 USD, €2200 EUR, £1990 GBP, ¥346680 JPY. Menswear should be all about style, versatility, and ease. Wouldn’t it be great if you could get up in the morning, get dressed for work, and have some durable and fashionable shirts for men readily available to you? Having a wardrobe that is both functional and stylish can save you time, money, and allow you to feel confident in your decision making when it comes to what you wear. We’ve all heard of business casual, but what is it really? Typically, it means wearing slacks or khakis, a shirt with an optional tie, dark socks, and dress shoes (never jeans or sneakers). The goal of this look is to ultimately dress down your business attire while keeping it professional. It can be easily dressed up with a sports jacket or dressed down even further to create a casual look with the change of a shirt, pants, or shoes. Business casual sets you up perfectly for a day at the office and with the change of a shirt can take you straight into your evening plans. Let’s say you woke up and chose black dress shoes, black slacks, and one of your dress shirts. You’re planning on going out with friends after work for dinner and want a more casual look. Swap the dress shirt for one of your casual shirts. A t-shirt with a nice V-neck, for example, and you’re good to go. Still looking stylish but comfortable, clean, and casual. Now, let’s say you’re going out for a more formal dinner after work. Instead of changing into a nice t-shirt, put a sports jacket on top and call it a day! The possibilities are endless as far as mixing and matching are concerned. When executed correctly, this look should leave you feeling neat, sharp, and comfortable. A great and versatile item to have in your wardrobe is a cotton suit. Thanks to the fashion industry utilizing new materials for suits, they no longer need to be stiff and uncomfortable. You can also use the pieces together or separately, allowing for multiple looks. When looking to accessorize, a professional watch (with a case no larger than the wrist) and a nice pair of sunglasses can do the trick. Don’t forget about the shoes! The typical black or brown leather dress shoe is always a classic choice. However, if you’re looking for something new, keep your eyes open for a pair of dress shoes made of suede. They’re comfortable, durable, long-lasting, and can be worn in formal situations or look just as good paired with jeans and a t-shirt. Traditionally, it would be unheard of to wear t-shirts, jeans, or sneakers to the office. But, it is worth saying that the fashion industry is challenging those traditional guidelines by putting items together that are considered extremely casual with items that are more formal, such as blazers and slacks. Ultimately, this leaves you with a lot of room to be creative and put together an entire wardrobe that can produce any look you are wanting to achieve with just a few items. With a little practice and wise shopping, you’ll figure out exactly what you like and what works best for you. When it comes to having the perfect wedding, every bride dreams of finding that ideal dress straight from a fairytale. But what if you are a bride on the budget? From dramatic ball gowns to chic minimal silhouettes, we rounded up nine amazing wedding dress designers. Discover names like Adrianna Papell, BHLDN, Tadashi Shoji and more on this page. Just because you are on a budget, it does not mean you can’t look like a million bucks. With prices ranging from $150 to $3,200, discover the full list of affordable wedding dresses below! Founded in 1979, New York-based brand Adrianna Papell offers chic bridal styles in the affordable range. Brides can choose from dresses that start at $150 and go up to $400. The collection includes a wide variety of styles including rustic wedding gowns, beaded dresses and lace embellishments. But Papell’s offerings don’t just end at dresses. The brand also produces those perfect finishing touches including shoes, jewelry and cover-ups. Launched in 2012, Katie May Neu launched bridal label Katie May after designing her younger sister’s wedding dress. She created the nontraditional backless gown for women. The gowns are made in Los Angeles with prices ranging from $280 to $2,500. May’s designs became known for their sensual shapes. The designer also launched Noel and Jean as well as a bridesmaid collection in 2016. You can find Katie May bridal designs at retailers like REVOLVE, Nordstrom and Shopbop. Another brand where you can find affordable dresses is BHLDN. Known as a wedding retailer, the company was founded in 2011 by its parent group Anthropologie. But in addition to carrying its other brands, BHLDN also has its own in-house wedding label. You can find gowns starting at $150 and they can go up to $1,600 for more detailed styles. Whether you want to keep it simple in an A-line gown or wear an embellished dress, BHLDN has plenty of options. In addition to dresses, the company also sells lingerie, bridal accessories, shoes and veils. Founded in 2009 by Natalie DeBanco, Australian brand Bronx and Banco also designs bridal fashions. Bronx and Banco is carried at retailers like REVOLVE and Bloomingdale’s. The brand designs chic and romantic styles ranging from short dresses to long and embellished gowns. Prices start at $415 for a minidress and go up to $1,120 for full-length gowns. We love this brand’s sequin embellishments as well as its lace overlays. An A-line, full skirt and long-sleeve styles channel bohemian vibes for those free-spirited brides. Opened in 2008, THEIA Bridal offers dreamy and romantic styles with sculptural shapes perfect for the bride looking for fashion forward looks. With a price range starting at $650 and going up to $3,200 depending on the gown style, these are a little more on the pricy side, but definitely worth it. Whether looking for a strapless gown or two-piece set or voluminous tiered styles, these designs are truly stunning. And a fun fact, the name Theia is named after the Greek goddess of sight and shine. She was known for creating the sparkle of gold, silver and other gemstones. Another brand that you should put on your list of wedding designers to follow is Tadashi Shoji. With his main line originally founded in 1982, the Japanese designer creates many elegant dresses for the special day. In addition to gowns and dresses, Shoji also designs gorgeous bridal jewelry as well as ornate headpieces. Prices start as low as $260 and go up to $970 so there’s plenty of options for those brides on the budget. Whether you want to look less formal in a little white dress, or look ultra-glam in a dramatic gown, there’s many designs. When it comes to bridal gowns, Shoji offers plenty of unique details. From off-the-shoulder necklines or lattice details and fringe, your dress can be as embellished or minimal as you would like. If you want to look across the pond for some bridal inspiration, Ghost London is the brand for you. Well-known in the UK, the company launched in 1984 meaning it has over thirty years of experience! Whether searching for your wedding dress or bridesmaid looks, Ghost London offers plenty of affordable designs. The company uses romantic fabrics including soft georgettes, crepe materials and luxurious satins. Their bridal gowns start at as little as $300 and go up to $1,000. If you are looking for a dress in a simple silhouette that shows off your figure, Ghost London is certainly one brand to check out. A minimal shape works perfectly with ornate jewelry and accessories. A well-known name in the fashion world for its ready-to-wear line, Badgley Mischka also has an amazing bridal collection. Originally launched in 1988, the company also produces shoes and handbags for the wedding day. From sleek, form-fitting gowns to embellished styles adorned with lace and beading include so many gorgeous styles. Badgley Mischka bridal dresses can usually cost within the thousands, but you can find designs starting at $700 and less at retailers like BHLDN. This proves that you do not have to break the budget to wear a designer name! Last but not least, we’re taking a look at another major name in wedding dresses–Pronovias. The brand dates back to 1922 in Barcelona, Spain, where Alberto Palatchi Bienveniste sold lace, embroidery and high-quality silk fabrics. Although started in Spain, their designs are now sold in over 4,000 points of sale in 105 countries. You can find Pronovias dresses at prices starting at $750 and they go up to $2,100. The company offers designs perfect for the traditional bride including lace embroidery, ruffles and tulles. Pronovias carries many different lines so you will have plenty of styles to choose from. And good news for curvy brides, they also carry a plus-sized range which goes from a size 14 to a 32. Now that you have read our guide to affordable wedding dresses, you should feel a lot more comfortable searching for that perfect gown. Whether you are searching for dresses that cost less than $200, or have a budget for over $1,000, there’s no shortage of options. From UK brands to American-made labels and designers from Asia, our guide offers wedding gowns from around the globe. Know of any other affordable bridal labels? Tell us below!